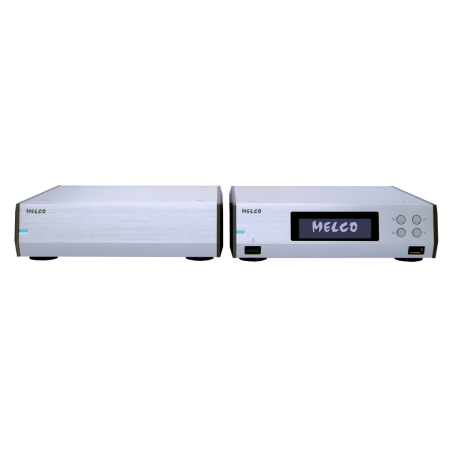 Melco N10 is a two box solution designed to improve sound quality by separating power supply and the head unit. Compact half-size head unit has selected 3TB 2.5” SFF HDD with all signal processing and connectivity, while the separate linear power supply is totally isolated from the head unit. The elegant solid aluminium casework has the familiar Melco OLED display and simple 4 button interface for delightfully simple operation and setup. To realise the 215mm width half-sized component, the head unit has both newly designed internal electronics hardware and new operating software. The case is solid aluminium including the end cheeks giving both a sophisticated look and also mechanical integrity and freedom from vibration, further assisted by a complex and rigid internal steel chassis. The front panel has the familiar Melco OLED display and four control buttons – from this simple interface both initial setup – just language and time zone – as well as advanced customisation can be accomplished. When playing music the OLED is very informative showing file name and data format. All connectivity of external devices is also confirmed on the OLED. Playing directly from CD using a USB CD loader such as D100, or playing directly from a USB drive, the OLED and buttons give full browse and navigation. The front panel USB port is convenient for connecting either USB drives or USB optical drive to import files or directly play. The rear panel has two additional USB ports which allow for USB connected CD loader, or USB HDD for music import or play. Additionally also Expansion of the internal capacity with either an IT USB HDD or the high sound quality E100 expansion drive to increase capacity of the N10 without any additional settings. Ethernet connectivity is special for all Melco machines – there are two ports. One is a dedicated Player port that connects directly to a network player or streamer without any intervening data switch or IT devices that would compromise sound quality. The second Ethernet port is the LAN connection for access to the N10 for music transfer, control of the N10 local player from a control App, and for accessing streaming music services, activating direct music downloads, and making Firmware updates with just one click from the Internet. A newly designed power management system in then Head Unit ensures stable and reliable operation. The Head unit contains the small form factor HDD, specially selected for sonic performance. The HDD is supported on the Melco HS-S2 – Highly Stable Storage System – to limit the influence of vibration. The HDD is mounted on a heavy stainless steel plate for damping heat-sinking, and there is additional 3 mm plate to complete the acoustic isolation. Housed in the same elegant solid aluminium casing as the Head Unit, the Power Supply has a toroidal transformer and extensive filtering to ensure a low noise supply. Connection to the Head Unit is by multi way cable with Neutrik connectors. The Power Supply Unit is supported on 3 isolating feet from TAOC.